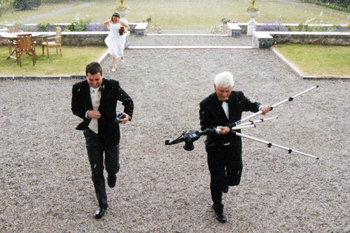 A photo in my archives from a family wedding in 2004 at Durrow Castle brought back memories! I scanned these photos because it was back in my film days before digital. 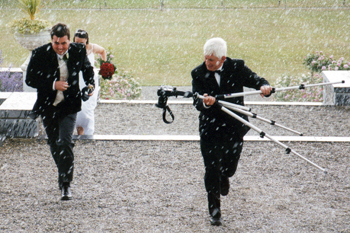 I was off-duty at the wedding but did however have the camera with me (there’s a surprise!). There was an increasingly dark cloud overhead. The photographer was outside in the gardens working his magic with the bride and groom. He had his tripod set up and was in full flow taking shots of the couple when the first drops of rain fell. Within minutes it was lashing, bucketing or whatever you’d like to call that rain that can soak you to the bone.